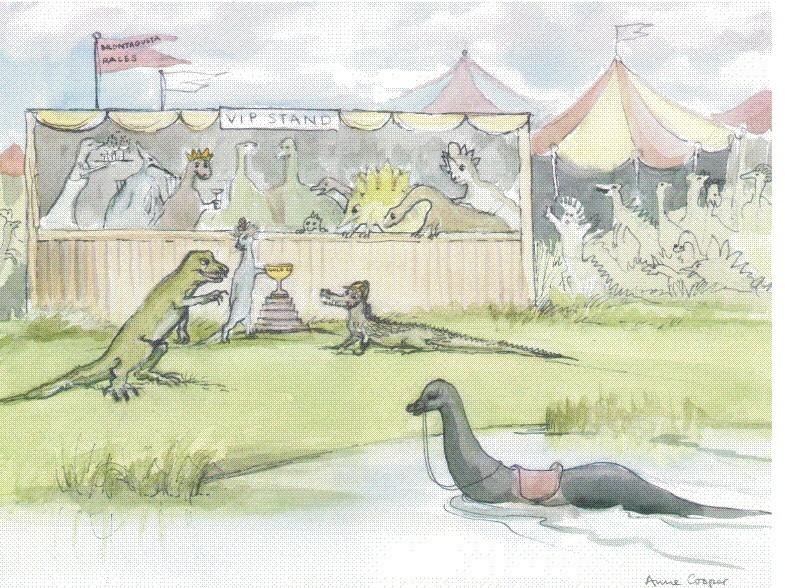 The Swamp Stories is a children's book about dinosaurs, particularly Sophie Pteranadon. The book can be bought with your child being the star. A number of years ago my mother wrote a series of stories for my daughter Sophie. She wrote in her introduction. Sophie sang this song to us when we visited her at Christmas 1989. 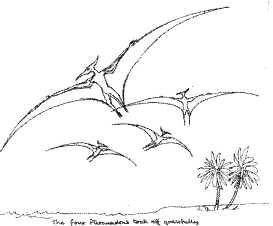 During that holiday we bought a model Pteranadon from Perth museum which she named Boy, and hung it from the living room ceiling. This gave me the idea for some stories to amuse Sophie. And the stegosaurus down by the swamp. Joins the Hurly Burly, Oh dear me. What a noise it's the boys of the prehistoric animal brigade. The book consists of 23 chapters some long some short, detailing the adventures of Sophie, a Pteranadon, and her prehistoric friends. Who live by the swamp many years ago, and do battle with Bad Jason the crocodile and the Wicked Witch of Mount Buttock, amongst others the . The book of 60 pages contains 10 beautiful water colour paintings similar to the one above, in addition a considerable number of line drawings. I have placed a three of the stories for you to look at. Rebecca does her homework, The Choir outing and Sophie goes to the toilet. Should you like the whole collection I can send a PDF format with your child's name as the hero. If you leave the cell blank the original hero Sophie will remain. The cost will be Australian Dollars 25 only. Please fill out the form below if you want to purchase the pdf file of the full stories. Your credit card will be charged to James Cooper Pty Ltd.